Females are able to produce cubs by 1 year of age. Males are fertile 2 years after birth. Both sexes are reproductive for the rest of their existence. The pregnacy lasts for about 2 months. Cubs are born with eyes shut. Cubs nurse for 2 months and then are gradually given meat to eat. 3-5 month old cubs go hunting with their mothers. Breeding season is in February and March. In the wild most bobcats live 2-5 years. In captivity they can live up to 12 and 15. Bobcats have sharp claws and teeth to help catch and eat their prey. 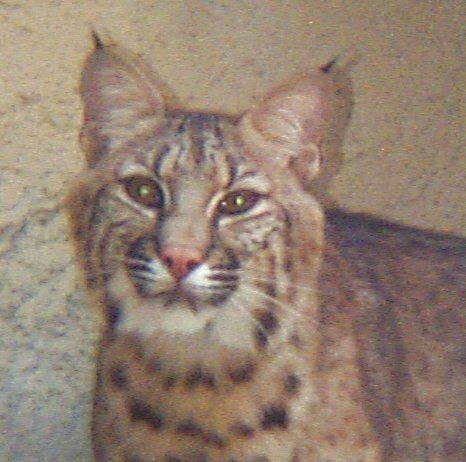 Bobcats have extra hair on their ears and cheek areas that are used to hear sensitive vibrations. 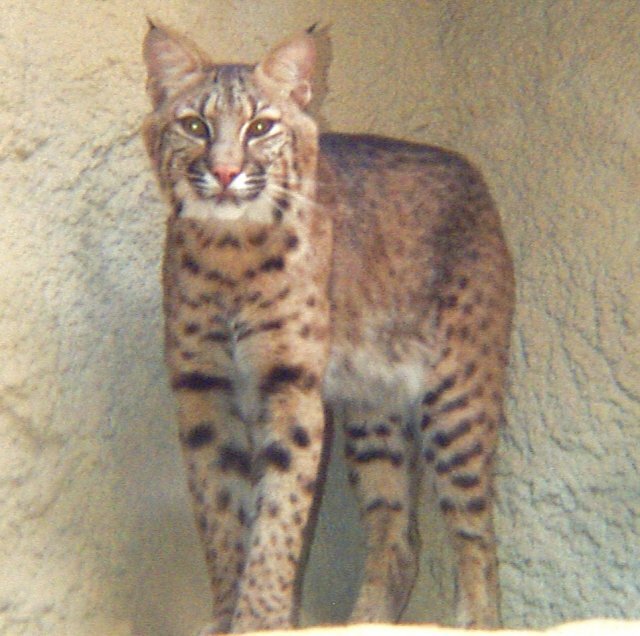 The Fort Worth Zoo has a male and female bobcat that are kept in the Brush Country in the Texas Wild Exhibit. They eat some sort of commercial beef mixture with a little horsemeat in it. The female seems more athletic, but the male also has his moments. They were both hand raised. The female is from a zoo in Alexandria, LA and the male was an orphan that was rescued from the metroplex area. The zoo keepers have special names that they call these two cats but they remain unknown to the public. 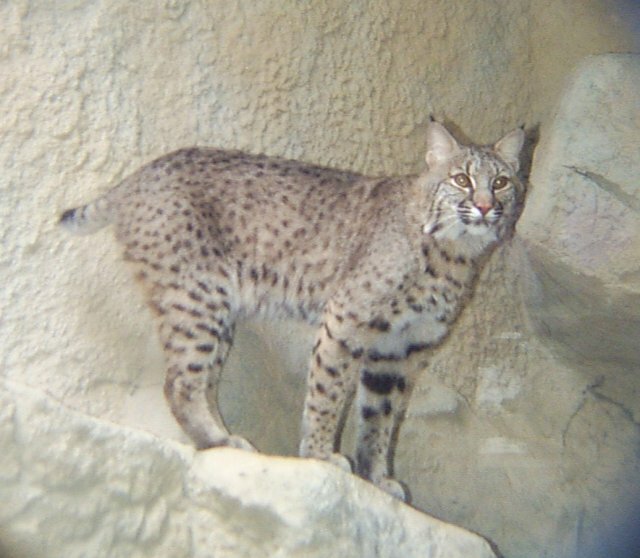 There is one male and one female bobcat at the Fort Worth Zoo. After a lengthy observation it seemed that the female was a lot more active and excited than the male. She would chase a piece of paper if you moved it across the glass. She would jump a few feet to try to reach it. She also liked ponytails swinging in front of the glass and tried to grab those too. 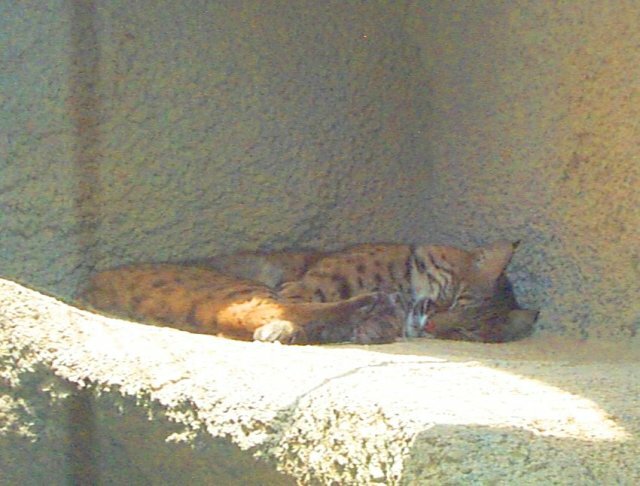 The female bobcat would constantly tried to play with the male but he never acted interested just serious, (which is typical of any male, human or cat!). She also tried to get out of the cage a time or two by climbing to the highest possible places and looking around. She sharpened her claws while I was visiting and she even jumped around even as to where I could tell how she moved. Kurt Giesler- from Fort Worth Zoo- spoke with him on October 24th at 4pm. Garman, Andrew. 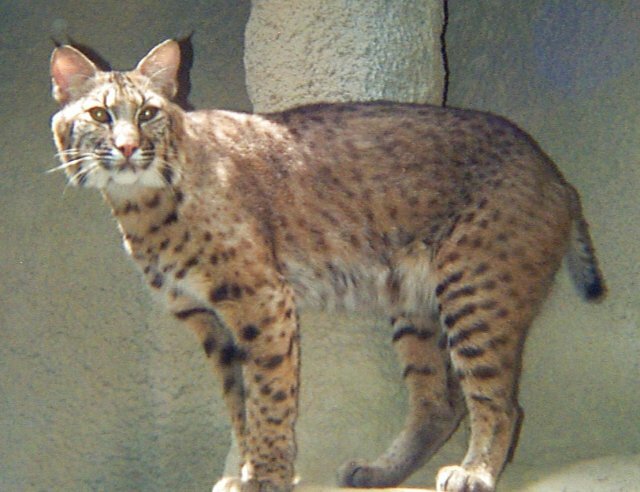 "Bobcat: Lynx Rufus." Big Cats On Line. 1997. http://dspace.dial.pipex.com/town/plaza/abf90/bobcat.htm 18 Nov. 2001. Thinkquest. "Bobcat (Lynx Rufus)." The Wild Habitat. 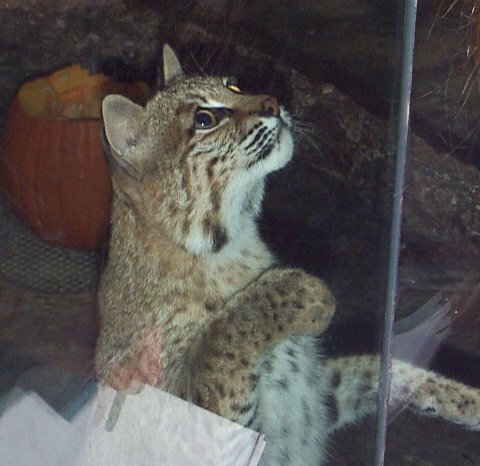 <http://library.thinkquest.org/11234/bobcat.html>. 18 Nov. 2001. Stacy Johnson-from Fort Worth Zoo- spoke with him on December 1st at 2:26pm.